My saturday evening began by meeting a friend of mine at 5 Guys for a bite to eat before we headed to the Roseland Ballroom for the 92.3 One Night Stand. As we walked in, DJ Earworm was on stage performing his hit 2010 mashup “Blame It On the Pop”, which features all the songs on the top 100 hits list of 2009. This was a phenomenal opening to the night, and a great way to follow up on my previous post where I had the opportunity to interview the amazingly talented young DJ. However, it all went downhill from there. Following DJ Earworm came Aaron Fresh. He at least had one, maybe two songs worth listening too, and there was definitely some talent there. But would it really have been asking too much to spare us from what came next??? Most people have heard the new one hit wonder “According To You”, but does anyone know who the artist is? Well, now I do….. and according to me, Orianthi has a thing or two…… or 50, to learn about songwriting. She is a fantastic guitarist, but I was completely unimpressed by her performance, as I am sure many who were there could agree with me. As my friend and I jeered at Orianthi’s performance, the girls in front of us (who could not have been wearing shorter skirts) gave us the glare from hell. I thought they were going to rip my head off….. it was hilarious. Needless to say, after this performance people started leaving, including my friend and I. As we headed back uptown towards the Triborough, we could not stop laughing at the performance that ruined the night. 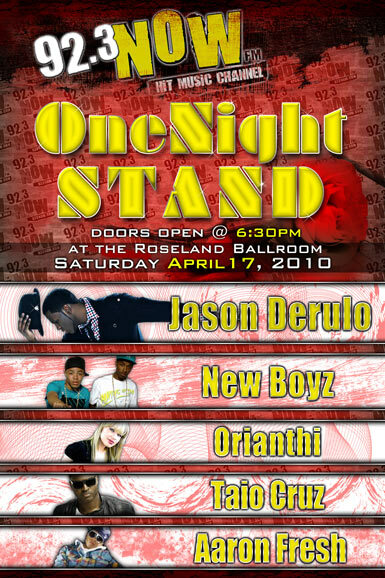 Unfortunately for Jason DeRulo and the adorable New Boyz, the house had emptied out a little bit, no thanks to Orianthi.